*** I am a paying subscriber of the Julep Maven monthly program. All opinions below are genuine, and all images below are copyright Momma Told Me Blog 2013. 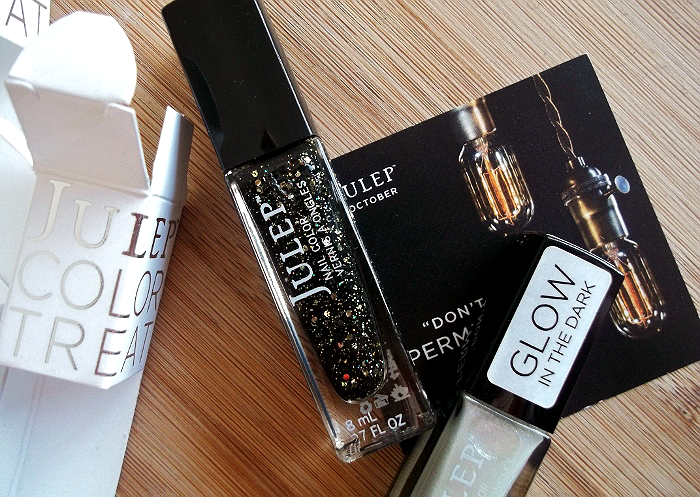 *** Want to try Julep Maven for yourself? Get your first box free with code PENNY or FREEBOX. Just fill out the style profile here, and you're on your way! Momma Told Me: The season is everywhere! The last quarter of the year is my favorite, not because the weather changes and the leaves fall (because, quite frankly, here in So Cal, we don't get much of a 'change'), but because of the whimsical touch that floats through the air. From October to January there are decorated houses and lawns, special spices and flavors sold in cafes and stores, and a general acceptance for that which would otherwise be out of the ordinary. Adults and children alike are encouraged to dress up, wear bright colors, eat large amounts of delicious food, and present one another with gifts- what's not to love? This is also the time of year I like to start getting more creative with my day to day fashion and beauty applications. I've been a Julep Maven subscriber now for over a year, and almost as long as the service has been rolling. It's no secret to my readers that I love a good monthly subscription box, and have tried over 50, but only pay for a handful faithfully. One of the things I love about Julep beauty boxes most is that I am never auto-charged or expected to buy any boxes or product each month. If I do not respond with my desired style profile for a particular month I will not be billed, and I will not receive a box; there is absolutely no hassle. So, on the 20th of each month, I log into my Maven account to check out the 4 boxes put together to match each of the 4 style profiles. 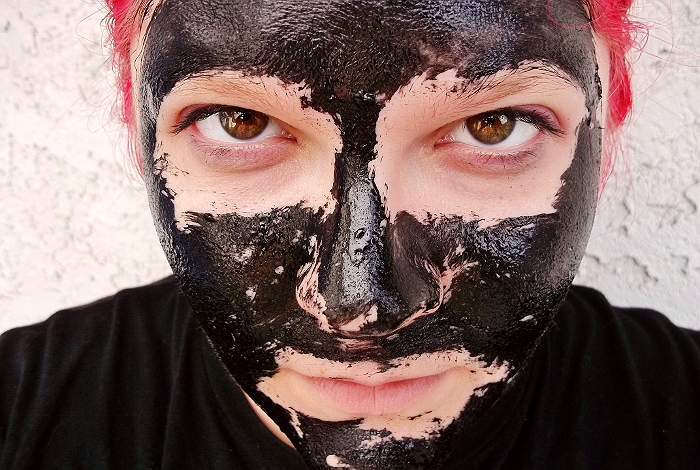 This particular month, nothing jumped at me- but I knew I wanted to try the featured beauty product; Mask Noir (which retails for $32 outside of this month's Maven selections). I also spotted a few bootiful hues of special edition lacquer Casper (a glow in the dark top coat) and Beatrix (a beautiful black glitter topcoat). Naturally, I made my own box choosing this month's Beauty Box (Mask Noir and Kajal Eyeliner) and adding on two shades of lacquer. This was my first time adding on to the box, and buying 'extras,' but I already knew I was coming out ahead with the Mask Noir (where the box was half the price of the mask, alone), and the lacquers were a special introductory $5 a piece! Like last year, my October box came with a bag of Candy Corn, a bed of black crepe shreds, and an inspirational quote. I instantly knew I wanted to go flirty, but witchy, with the Beatrix topcoat (which is just as gorgeous in person) and tossed it over a previous Julep hue, Billie Jean (purple). The little pops of sparkling silver in Beatrix really made my pedicure pop, and has garnered countless compliments. Sabrina (11) immediately confiscated my Casper topcoat and demanded I do an instant mani- the result Claire's Startstruck (Little Dipper, Orange Shimmer) with a topcoat of Casper (which adds a light haze), and hand painted spider and jack o' lantern detail. 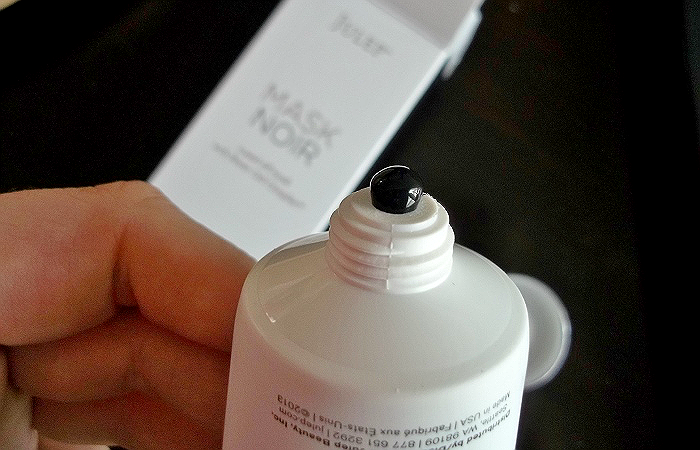 As a self professed masque addict, I could hardly wait to get Mask Noir on my skin, something that promised to be unlike any masque I'd ever tried before. 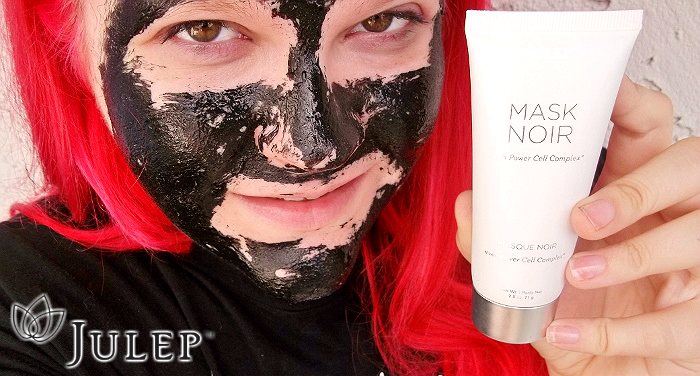 Infused with black volcanic ash for it's anti-inflammatory properties and Kaolin Clay for deep cleaning, Mask Noir has a distinct latex like dispensing texture. It is jet black and almost rubbery, which lends itself perfectly to it's advertised 'peel off' nature, but does tend to make it a little fussy to apply. This masque seemed to dry, or set, almost instantly, and going back over a spot that was applied already only resulted in a clean peel of the existing masque, so you truly have to be quick and precise with your application. I left the Mask Noir on for about 15 minutes and experienced minor tightening as it dried. Peeling the mask off was extremely simple, though a gentle rinse of lingering particles is suggests. I noticed that my pores opened quite a bit after the first application, providing the perfect time for a deep cleanse or microdermabrasion. In all, however, the mask was very gentle on my skin and had no offensive odors or fragrance. 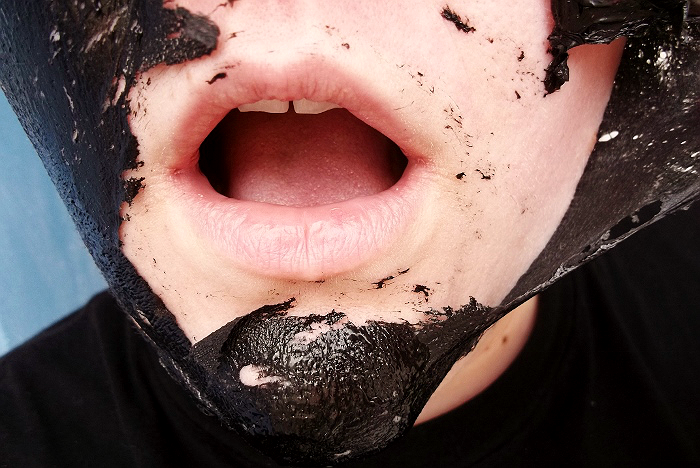 It was, truly, the perfect new beauty experience for this particular month- peeling black 'skin' off my face certainly was terrifying. The things us women do for beauty, right? 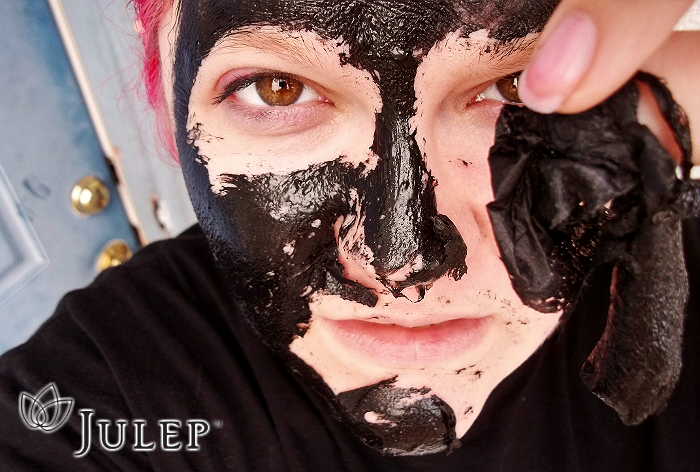 In all, I still prefer slow drying mud based masques, but Mask Noir was a great experience I'll enjoy integrating into my beauty routine throughout the rest of the year. Another great month of Julep Maven! If you need a little extra nail inspiration, try your first month of Julep for a penny (Code: PENNY) or free (Code: FREEBOX), when you sign up here. 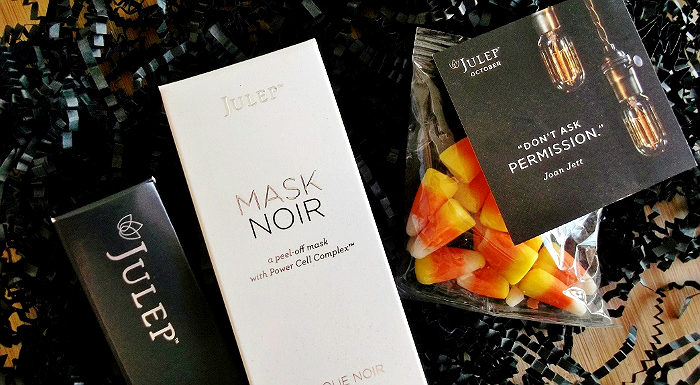 What Daughter Says: Bring a little seasonal fun to your beauty routine with inspired boxes from Julep Maven. I love the colors! What a wonderful theme for a Halloween box! Very brave of you to post with the mask on your face but it sure let's people know exactly what it looks like and how it works. 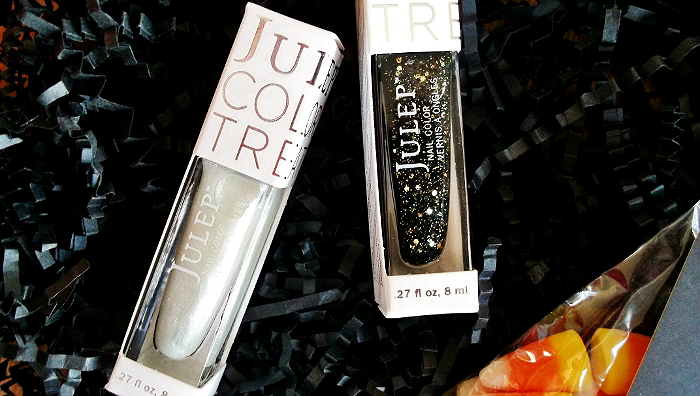 I have the dark polish from an older Julep box but have never used it. Thanks for the idea! The glow in the dark would be SO COOL for Halloween!!! What gorgeous nail polish!!! I love all the colors! 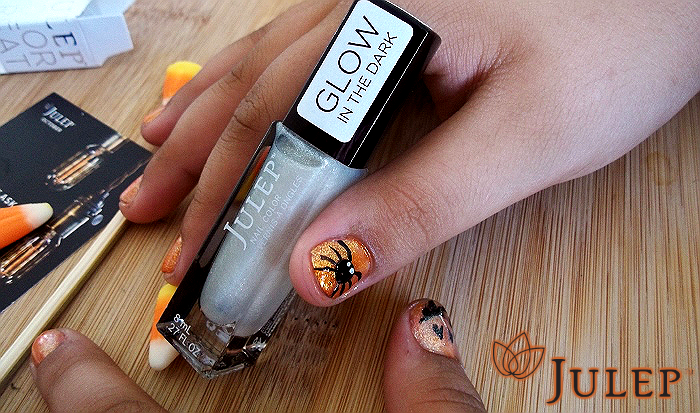 Those Halloween inspired spider nails are just TOO. CUTE!! I myself am a mask junkie, too, so I can understand the draw. That one looks really neat and I like that it's anti-inflammatory, too. This is so awesome! Thanks for the great post! I'll be checking this out! I LOVE the nail art. That face mask looks interesting too. I just did some fun nail art for my daughter last night. You inspired me.